Staying in room No 506 Surely no 1 in guangzhou Location can't be better Very clean Helpful and polite staff and ask them for anything like towels replace etc etc. Done immediately. I am very comfortable as is a clean and family hotel with everything perfect that you can think off. Terrible stay . Standard has dropped completely. From the beds and pillows to the shower . Nothing in the kitchenette - no cutlery or crockery AC doesn't work. The only thing that's nice is the location. Always a first choice for my business trip to Guangzhou. Check in is fast and easy. Staff can converse in English. Room is spacious and clean with all the basis necessities. Kitchen is big but do not have cooking stove or utensil. Only have a kettle to boil water. There is a washing machine. Well lite, air Cond is cold, water pressure is good but the water heater is not hot enough. Comfortable bed and pillows. Stayed here for 4 nights, simple but clean rooms. The hotel could use a 'lift up'. The soundproof windows does not do the required job. Noisy street which you can easily hear even if you close the window. No breakfast served in the hotel. I stayed here for a short holiday weekend when visiting from Shenzhen. It's a very clean hotel and the location is great! Close to a lot of different restaurants and there is a metro stop nearby. Would stay again! We stayed at this hotel during the Christmas 2016 weekend. The location is wonderful, walking distance from restaurants and tourist attractions. The apartment was clean and the staff nice. The kitchen looks lovely but as was pointed out by another reviewer, no cooking utensils. The hotel did provide a teakettle and complementary tea. Stayed at this apartment in December 2016. Very spacious with 3 good sized bedrooms. Located close to restaurants and the Metro. About the only issue was that there was no crockery, cooking items, cutlery etc, not even a toaster. Just two cups and some glasses in the bathroom. So if you wanted to prepare your own meal or even have a glass of wine you would have to supply your own cooking implements. This is probably not a problem for a couple of nights, but if you were staying longer it might be an issue. But overall I was very happy with the quality and value that this apartment provided. Me & my Father are regular China Import & Export Fair (Canton Fair) visitors and we & our small entourage from the Office stay at Ascott Serviced Apartments in Guangzhou. This year however, I did my research before the Expo selected Xcellent Serviced Apartments through the Canton Fair Website, which was also giving a very good deal. So we decided to give it a try. It was great, although not as luxurious as Ascott, but at the same time, heaps more economical. 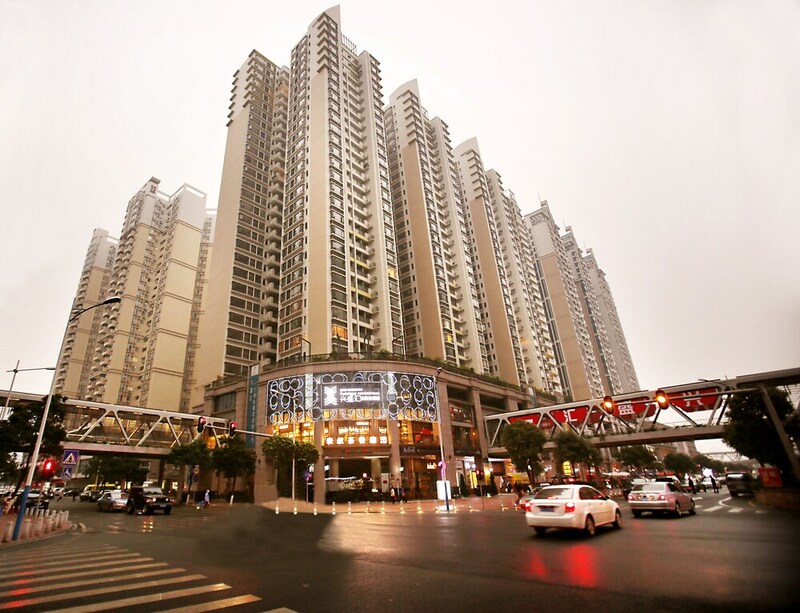 I will consider staying at Xcellent Serviced Apartments for my next Canton Fair visit to Guangzhou. There are numerous wining & dining options around like Bars & Restaurants. There are also many Family Marts & 24 Hrs. Convenient Stores just below the apartments. TIP - Contact General Manager - Erica Kang directly to get best deal for the apartments. The team here has lifted their game and our 5 day (9-14 Oct 2016) stay was a most enjoyable. The King sized bed was great (most beds in China are rock hard, our's was medium/soft, Good mix of pillows also!) so we slept well. Air Conditioning was ample and very quiet, housekeeping were excellent, Internet was super fast (25mbs DL/36mbs UL[peaking to 40mb/s]) and our VPN allowed us to stream AU TV shows, Youtube, Google, etc.. We only had a 45sqm 1 bedroom suite which is typical of those we saw here and allbeit in need of some renovation, the unit was insect/dirt free and 10/10 for room cleanliness. Everything worked, nothing shabby or broken, nice Balcony (~4sqm) and newish furnishings, plentiful soft hot water, very good quality toiletries. We go to Guangzhou several times every year and this was the best of many stays. Well done to the Xcellent staff team. This place keeps getting better with time. Will definitely be back in a few months. You can get rooms here for less than US$100 a night which puts this place in the budget category, but I rate this place better than some US$250/night just down the road. Hooleys is a great Western restaurant/bar just 80m away, plenty (>5) of 24/7 convenience shops within 150m. The Liede MTR station is about 220m away (Exit D) and plenty of parking for your hire car in the 3 level basement car park. Good English spoken at front desk 24/7. I stayed there for 8 days in 2015. The staff is amazing but they don't speak English very well. We had some problems of communication at the beginning, but it was easy to solve. The hotel has a very good location. It's beside an international place where you can find a lot of international restaurants and it's also near the subway station. It's near the canton tower, a wonderful place. Located in Zhujiang New Town, Xcellent International Serviced Apartment is within a mile (2 km) of sights such as Guangdong Museum and Guangzhou Library. This 256-room, 3.5-star apartment building welcomes guests with conveniences like free in-room WiFi, concierge services, and express check-in. It's connected to the convention center in central Guangzhou and also close to Canton Tower and Canton Fair Complex. Each apartment has an array of amenities, including free bottled water, a laptop-compatible safe, and a phone. A 42-inch LCD TV comes with digital channels, and guests can stay connected with free WiFi and wired Internet. Beds sport premium bedding. Xcellent International Serviced Apartment features free WiFi in public areas, express check-in, and express check-out. If you decide to drive, there's free offsite parking. Staff members can answer questions about accommodations, and also provide concierge services. The preferred airport is Guangzhou (CAN-Baiyun Intl.). Checking in and out are easy with express services. Driving? This property offers free nearby parking. The following credit cards are accepted: Carte Blanche and Discover.